So, once upon a time, Kirk, Bones, Scotty and Uhura moseyed over to a universe that was not our own and set off a fan-favorite phenomenon that melted into pop culture in the form of goatee-wearing versions of all our most loved TV friends. We didn't see the other side again until DS9. They were practically in love with the mirror universe and Sisko made more trips over there than anybody. It disappeared again during only to be resurrected at the very end of Enterprise's run. And man, what a resurrection it is. In a Mirror, Darkly is an astounding mix of tropes from The Original Series all viewed through the other side of the looking glass. It's as if the writers/producers had a check list of all the stuff from TOS they hadn't got around to doing and just did it. The episode is a prequel to Mirror, Mirror but a sequel to The Tholian Web. Thanks to the crew having worn their EV suits over to the Defiant, they all get change into the absolutely fabulous TOS-era uniforms. The old style phasers have a glorious kill setting that straight-up dissolves a guy. There's a dead red shirt on the bridge (exactly where he was in Tholian Web--a nice touch.) Everyone's drinking Romulan Ale and eating Play Dough cubes. Soval has a goatee. 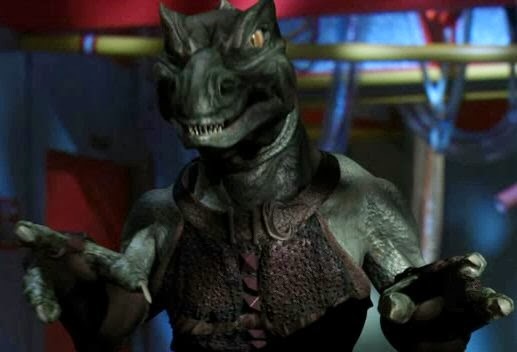 And, oh yeah, a GORN shows up. This is an absolutely beautiful, amazing two-parter. It's chock full of lines and bits that refer to The Original Series and beyond. It is more than worth the watch. It's essential. And, it is the very last romp for My Year Of Star Trek. Sadly, it was in the shooting of this episode that Enterprise was officially cancelled. At the time that most of this stuff was being filmed, they were still hoping for more. I was still hoping for more. During this viewing, after being reminded of what wonderful, creative things this show was capable of, it just depresses me that Enterprise didn't get a better shot. Season 4 (of Enterprise) is the best season of all Star Trek series. What a high-note to end your year-long quest on!!! Congratulations AshleyRose! And thank you for this blog and taking all of us along for the ride! I really, really hope you keep going into 2014. I'll keep coming back - this much is certain!! This one was quite possibly my favorite arc too. I haven't seen them in a few years, so it's hard to remember them all to judge. Loved the revised opening!